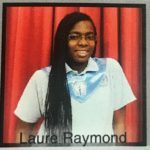 Class of 2014 Alumna Laure Raymond recently finished her senior year at Barnard College, where she majored in Biology. 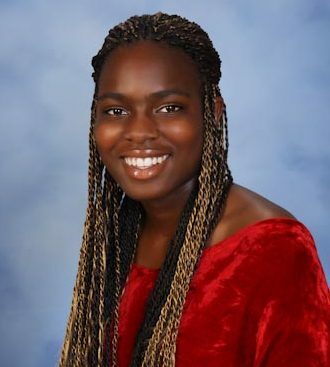 When asked why she chose that major, she replied, “Because I love Biology!” This past summer, she headed off to Liberia to volunteer with the Peace Corps for 2 years as a high school science teacher, where she will be able to share her love for Biology with others. Laure’s interest in the Peace Corps began in her junior year at SJHS, in Mr. Cooke’s Business Class. Having been assigned a “5 year plan” project, she began to research what she might do with her interests in science, medicine, and humanitarian aid work. In the process, she came across the website of the Peace Corps and was immediately drawn to the mission to bring trained volunteers to communities worldwide in need of assistance, and to improve the relationship between Americans and people in communities served by the Corps. Initially she thought she might be able to serve in her native Haiti, where she was born and spent much of her childhood, but she soon found out that the Peace Corps offices in Haiti have been closed since 2004 due to safety concerns. Since she was still in high school at the time, she put her dream of joining as a volunteer, as well as the decision regarding where specifically to serve, on the back burner for the time being, and focused on classes, college applications and immersing herself in the many co-curricular activities available at SJHS. Until she began high school Laure considered herself to be a pretty solitary, quiet person, different from other people and even friendless, as she read books and studied on her own. But upon entering the tight-knit SJHS community, things began to change. 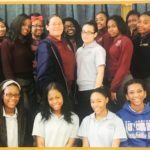 She discovered that three of her St. Francis of Assisi classmates had also decided to attend SJHS, and though they were not very close in middle school, they soon became inseparable in high school. 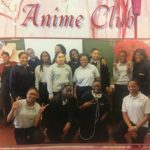 This group of friends became her “family away from family” – always together, and always pushing each other to go above and beyond in their classes and other activities. Just for fun they would debate all kinds of topics together, and they challenged each other to be “strivers,” seeking to learn and grow as people as well as students. 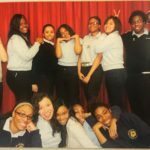 For Laure, this opening up to others and growing socially was the most significant and lasting aspect of high school, from which she has taken lessons into her life as a college student and beyond. “You’re not made to be rigid! You’re made to grow,” she says. Check out some photos from Laure’s time at SJHS! 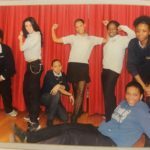 This process of personal growth through friendship that began at SJHS continued as Laure attended Barnard College beginning in the fall of 2014. True openness to others in friendship requires letting the unexpected into one’s life; each person presents endless unknowns and surprises! While many of her college classmates were full of worry when their plans for the future didn’t pan out exactly as expected, one of the most striking things about Laure is her willingness to follow where life leads. She is full of positivity even though life is full of unknowns that can’t be predicted, and that tend to throw perfectly laid plans off track. And she tries to share this spirit with her friends when they get overwhelmed by the complexities of life.